« Interview with a British girl whose role model is Girls generation. Mini interview with Riona, Japanese girl, and the very person of the rumors. Last year a Japanese girl became talk of the town because of her youtube videos for a while. In the videos, she danced to Kpop songs like “Hoot”, “Tell my your wish”. Some Korean netizens said she would be a trainee under a certain Japanese entertainment and seemed to just be about to debut to counterattack the Korean invasion. Some others said she would be an ordinary Japanese girl in love with Kpop. Sarangkpop decided to investigate the rumors and had a mini interview with the Japanese girl. This is the mini interview. 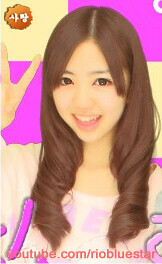 My name is Riona. I’m 15 years old and I live in Japan. My hobbies are to dance and sing. I also love to listen to music! 2. are you a trainee? 3. are you under a Japanese entertainment company? 4. are you going to debut as a singer? 5. do you have a dance team? 6. when did you start dancing? I started dancing when I was 12 years old. 7. do you sing well? Umm, I don’t know….lol I hope I sing well. 8. you practice once a week. Do you practice dancing and singing together? Where do you practice? 9. are you a model? Well, I did a sponser for kids’ clothings. .
10. do you know many Koreans watched your Youtube videos? 11. when did you get to know kpop? Well, I was on youtube and I just clicked on a video, and that was SNSD’s music video. Ever since that, I love K-pop! 12. who is your favorite K-pop star? 13. do you want to be a Kpop star?